Are thank you notes going the way of the telegram? A recent New York Times article says this could well be the case. Seems that most people under forty don’t revel in beautiful monogramed, cream-colored stationary and elegant fountain pens. It’s too much effort to go to a store and search for an appropriate card – and who uses stamps anymore? “Snail mail” is called that for a reason. Electronic communication is faster and doesn’t kill trees. Why write a thank you note when you can send a text? Or so goes the argument. I admit to being old-school on this one. I love the look and feel of paper. There are times when I take real pleasure in writing with a micro-point black marker in hand. I can’t imagine keeping a journal that is electronic. While I use a keyboard for most writing, only a yellow legal pad will do to make an outline (old-school again, I know) or a plan. The bigger question is not form but content. With the rumored-demise of the thank you note, do most of us email our gratitude? Make a phone call (especially if we know the person might be home and we can’t leave a message)? Give more hugs? I’m not seeing it. 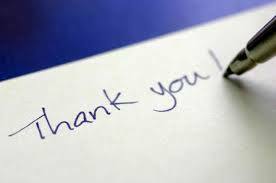 With the demise of the paper thank you note, I observe we are seeing fewer thank you’s in any form. Graciousness, it seems to me, especially the kind that takes a certain kind of effort, is taking a hit – again. Is the whole topic of gratitude just, well, boring? An even bigger question is if we owe thank you’s to the Creator of the Universe. Do we really think the God of all the world is just waiting for whatever form of gratitude we remember to send heaven-ward? The Gospel for Sunday is the story of the Ten Lepers – one grateful, nine not – in which Jesus gives us his take on the subject. It’s not boring. I promise.